Ponce Inlet is a quiet,small beach town, just North of New Smyrna Beach, only separated by the inlet from the ocean which feeds the Halifax River. Click here for Town Website. Ponce de Leon explored this area in 1513. Ponce Inlet is famous for Florida’s tallest lighthouse which was initially built in 1883. Click for lighthouse information. The population was 3,032 at the 2010. Neighboring towns are Wilbur by the Sea, Daytona Beach Shores and Port Orange. When choosing a location for a beach wedding, Ponce offers both convenience for those who may have guests with handicapped or accessibility issues as well as more private and intimate settings away from the tourist areas. 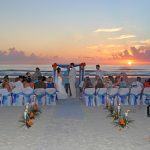 If you are staying in a hotel, timeshare, condo or house on or near the beach, you may have your wedding on the beach directly in front of your lodging as long as there is access for for us to do setup and your guests. 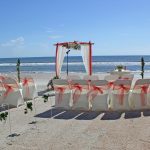 And Paradise Beach Weddings can help you with planning your lodging, receptions, catering, restaurants, floral, hair – makeup, cakes and other needs while you are in Ponce Inlet! The following map shows two of locations with public access, parking and are suitable for beach wedding setups in Ponce Inlet. There are many other areas to get married, these are just some popular locations. Click on map pin or the name of the location in the list below the map for detailed information.